Now performed all over the world, Giuseppe Verdi’s Aida was the outcome of a direct commission from Egypt’s ruler, Isma'il Pasha; a statement of his ambition for his country to become the bridge between the European and African continents. Pasha had originally hoped to entice Verdi into writing a hymn to celebrate the opening of the Suez Canal, an occasion that would also be marked by the building of a new opera house in Cairo; but the composer showed little interest. After Verdi’s Rigoletto was performed for the dedication of the Khedivial Opera House on 1 November 1869, the Egyptian Viceroy was determined to have a new work, his own world premiere, to match the splendour of his theatre. 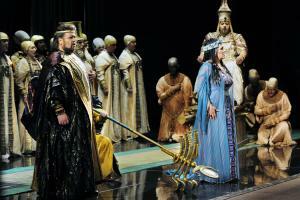 The result was Aida, which was performed at the house for the first time on 24 December 1871. Aida is classic Verdi: a tale whose dynamic stems from one individual’s love for another being thwarted by the world that surrounds them. Two warring nations, Egypt and Ethiopia, are the backdrop for the more intimate story of Radames, leader of the Egyptian forces, and his affair with Aida, daughter of his enemy’s King. When Radames helps Aida and her father to escape their Egyptian captors, he betrays both his people and Amneris, daughter of the Pharaoh, and his future wife. Aida, which now returns to the Vienna State Opera where it was first performed on 29 April 1874, is the supreme example of ‘through-composed’ opera - a break from both Italian and French tradition - where every single note of music serves each step in the plot. Arias, duets and choruses all drive the action forward, but it is when two voices meet, no more so than in the lament sung by Radames and Aida, “La fatal pietra sovra me si chiuse” (“The fatal stone closes over me”), that Verdi is at his most intense and dramatic.